UNITED NATIONS — President Donald Trump urged world leaders Tuesday to help restore "democracy and political freedoms" in Venezuela, singling out the South American country for some of his most blistering criticism in a speech to the United Nations. Venezuelan President Nicolas Maduro hit back by calling the U.S. president "the new Hitler" of international politics. He also accused Trump of threatening to assassinate him, even though Trump did no such thing. Trump threatened to build upon sweeping economic sanctions that the U.S. slapped on Venezuela last month if Maduro "persists on a path to impose authoritarian rule." But he did not repeat an earlier threat to consider military options to pressure Venezuela, a day after dining with the leaders of four Latin American countries who made clear they would not support such action. "The Venezuelan people are starving and their country is collapsing. Their democratic institutions are being destroyed. This situation is completely unacceptable and we cannot stand by and watch," Trump said. "I ask every country represented here today to be prepared to do more to address this very real crisis." Maduro, who did not attend the U.N. General Assembly gathering, reacted angrily from Caracas, calling the speech an "aggression from the new Hitler of international politics, Mr. Donald Trump, against the people of Venezuela." 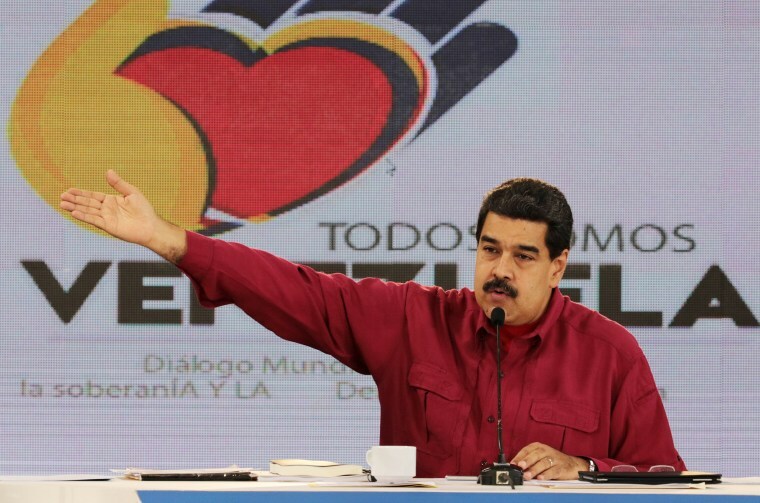 "Nobody threatens Venezuela and nobody owns Venezuela," Maduro said. Maduro added that as he understood the speech, "Donald Trump today threatened the president of the Bolivarian Republican of Venezuela with death." However, Trump only said that the U.S. is "prepared to take further action" against Venezuela. At the U.N., Venezuelan Foreign Minister Jorge Arreaza also condemned Trump's remarks but he ignored questions at a news conference about the criticism Venezuela faced from other leaders at the U.N. gathering. Latin American affairs often take a backseat for Washington during international gatherings, but Trump has made Venezuela's political crisis a priority at the U.N. During his speech, he spent as much time criticizing Venezuela as North Korea, Syria and Iran. Venezuela was the key topic at a dinner that Trump attended with the leaders of Colombia, Brazil, Panama and Argentina. Maduro's government has become increasingly isolated in the region, although he retains the loyalty of several left-leaning Latin American governments and small Caribbean countries who import Venezuelan oil on favorable terms. A dozen Latin American foreign ministers plan to meet at the U.N. on Wednesday to discuss possible new measures to address the Venezuelan crisis. Those same countries met last month in Lima where they denounced Venezuela's "democratic collapse." Venezuela's government faced international criticism after a Supreme Court decision in March to gut the opposition-controlled congress, a ruling that was later reversed. More recently, a constitutional assembly wholly made up of government loyalists has been installed and proceeded to go after Maduro's political opponents. Several prominent opposition mayors have been removed or ordered arrested by the Supreme Court. Tens of thousands of Venezuelans have fled the political turmoil as well as widespread shortages of food and medicine and triple-digit inflation. Brazilian President Michel Temer highlighted the Venezuelan exodus in his own speech and declared that, "in South America, there is no longer room for alternatives to democracy." In Venezuela, opposition leaders welcomed the attention the country has received at the U.N.
"All the presidents are absolutely concerned about the need for an immediate solution for Venezuela, a democratic and peaceful solution," said Julio Borges, the president of the opposition-controlled National Assembly. But elsewhere in Caracas, several thousand government supporters marched in protest against the United States. "The American empire wants to step on all countries that want to advance, but we will not surrender," said Yirialdy Echandia, a 37-year-old student.